When we first heard whispers that Fender’s biggest NAMM 2019 release was a line of USA-made acoustics, it felt like something of a curveball. Over the years, the brand that popularised the modern solidbody electric has had an on/off relationship with acoustic instruments, although the Paramount and California series of recent times prove that the current Fender chiefs take the needs – and dollars – of unplugged players seriously. When the news broke a couple of days ahead of NAMM that the new American Acoustasonic Telecaster was a lot more than a simple acoustic instrument, things became much clearer. A Telecoustic this is not. The design may be new for 2019, but its name isn’t. 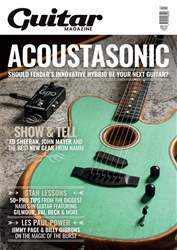 ‘Acoustasonic’ has been used by Fender in the past for a range of acousticguitar amplifiers, a Strat-shaped electroacoustic and most significantly, the previous Acoustasonic Telecaster model, launched nearly a decade ago. A hybrid design hewn from chambered ash with a spruce centreblock, the 2010 model was manufactured in Ensenada, Mexico and fitted with a Fishman undersaddle piezo bridge, a side-mounted Aura preamp and Twisted Tele neck pickup for more traditional electric sounds. 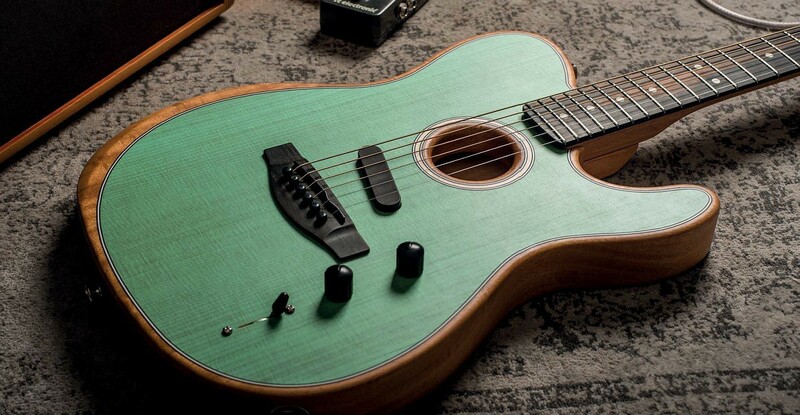 Though its progenitor was in many ways more Telecaster than acoustic, this time around, Fender has made the physical architecture more acoustic-like and considerably more innovative. Construction takes place on the USA side of the border, primarily in a dedicated space upstairs in the company’s Corona factory, and the guitar has been equipped with a new Fender and Fishman-designed ‘Acoustic Engine’ to deliver a range of flat-top voices as well as Telecaster bridge-pickup tones.